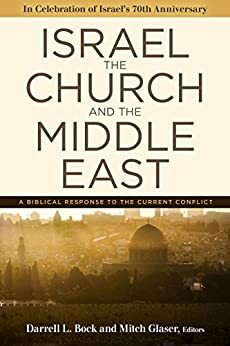 Israel, the Church, and the Middle East, By Darrell L. Block and Mitch Glaser, 2018, 304pp. It impacts how we read the Bible. Hence, do we read the Bible as one continuous story (from Genesis to Revelation), or do we just read the New Testament and skip the Scriptures that both Jesus and Paul read? It impacts our view of the character of God. It impacts our view of ecclesiology (the study of the ekklesia). It impacts our missiology: the area of practical theology that investigates the mandate, message, and mission of the ekklesia. It impacts our view of eschatology. It impacts our view of Israel today and the Middle East situation. Several of the chapters in this book have very strong exegetical arguments. The chapters by Blasing, Bock, Rydelnik, and Michael Brown are all very exegetical. I will offer some of the highlights from these chapters. Bock’s chapter on Biblical Reconciliation Between Jews and Arabs focuses on inaugurated eschatology ( the “already but not yet”) theme which is seen in Luke/Acts. Bock sees a relationship between the period of time that includes rest and refreshment that Peter preaches in Acts 3:18-21 and several texts in the Tanak such as reconciliation Isaiah: 2:1-4; Isa.19: 23-25; Isa.55-56; and Romans 11. As Bock says “ Acts 3 is a reflection of what they learned from the Acts 1 exchange with Jesus. This entry into refreshment is the completion of God’s plan with Christ’s return. Peter urges repentance so that one can participate in God’s entire planned program from start to finish. A key aspect of that program is Jesus’ return, when the Christ will exercise judgment on behalf of righteousness and complete God’s promise already outlined in the prophetic teaching of the Hebrew Scriptures. Nothing Peter says indicates that anything promised there has been changed, including what is said about Israel.” Note that the tone of this chapter is reconciliation. This book isn’t about bashing Palestinians, nor does it endorse some sort of blind allegiance to Israel. Rydelnick’s chapter on “The Hermeneutics of Conflict” gives an overview of The Abrahamic Covenant. This covenant will never be rescinded because it is based on the sworn oath of a God who cannot lie (Gen. 22:16–17; 26:3; 50:24; Ex. 13:11; 33:1; Deut. 4:31; 6:18; 31:20; Ezek. 36:7–15). He also discusses the use of “Min olam v’ad olam”- (“from everlasting to everlasting” or “forever and ever”) which is used to describe the eternal blessedness of God (e.g., 1 Chron. 16:36 “Praise be to the Lord, the God of Israel, from everlasting”). The phrase describes the lovingkindness of God to be eternal (Psalm 103:17, and God’s existence to be eternal (Psalm 90:2). It is possible that the Hebrew word used in these passages (olam) and translated “forever” does not necessarily mean “for all eternity.” (Ex. Exod. 21:6 discusses a slave who willingly accepts to service to his master. When his ear is pierced, “he shall serve him forever” (olam). The Hebrew phrase min olam v’ad olam is the strongest expression in Hebrew to describe perpetuity and eternality. There are only two expectational usages in which the phrase does not refer to God: In both cases it refers to the nation of Israel’s eternal possession: To sum up, God gave the land as an everlasting possession, meaning ownership was to be forever; (2) this land promise is part of the Abrahamic Covenant; (3) the covenant is everlasting. “ In Rom. 9:1–3 the apostle makes plain his compassion and concern for the lost condition of his unbelieving brethren. So great was his love that he makes the remarkable statement that he would be willing to be accursed and separated from the Messiah, if this could provide spiritual life for his people. There is no question that Paul is speaking of unbelieving Israel here. Nevertheless, he describes them as having a significant national status: “They are Israelites, and to them belong the adoption, the glory, the covenants, the giving of the law, the temple service, and the promises. The ancestors are theirs, and from them, by physical descent, came the Messiah, who is God over all, praised forever. Amen” (HCSB). The present tense verb in verse 4 demonstrates that all the benefits described still belong to Israel. As Thomas Schreiner writes, “The present tense verb εισιν (eisin, they are) indicates that the Jews still ‘are’ Israelites and that all the blessings named still belong to them.” (see Thomas R. Schreiner, Romans, Baker Exegetical Commentary on the New Testament (Grand Rapids: Baker Books, 1998). Blasings chapter called “ A Theology of Israel and the Church” centers on ecclesiology. He mentions what is called “supersessionism.” In this case, “economic supersessionism” argues that Israel, the “earthly” people of God in the Old Testament, has been replaced in the divine plan not by another “earthly” people or peoples, but by a “spiritual” people, the church of the New Testament. In this form of supersessionism, Israel was never in God’s mind more than a temporary reality ultimately to be superseded by “a new Israel,” the church. Accordingly, the ethnic, national, and territorial promises to Israel have to be spiritually interpreted in order to discern their true meaning. While economic supersessionism allows a place for individual Jews in the church alongside Gentile believers, neither their ethnic identity nor that of any other peoples has any ultimate theological significance. In the consummation, the church replaces the entire multi-corporate (multi-national, multi-ethnic) structure of historical humanity. There will be only one “nation” of redeemed humanity, a “spiritual Israel” which replaces Israel and all Gentile nations. It should not be surprising that economic supersessionism has been criticized as anti-Semitic due to its rejection of the ENT aspects of corporate Israel, and this is not without consequence in the church’s relationship with individual Jews.” Most of Blasing’s chapter centers on ecclesiology. “The people of Israel have never possessed the entirety of the promised land; 2) the Scriptures indicate that Israel will not do so until the fullness of the Messianic era; and 3) Israel is in the land today by grace not by merit (meaning, Israel has not fulfilled the Sinai requirement of repentance, as laid out in Leviticus 26:40–45 and many other passages). Accordingly, this brings us back to the last two questions posed above, viz., On what basis, then, does Israel have a “right” to the land at this point in time, other than the sovereign choice of God? And if it is based on his choice, perhaps he wants the land divided until the time of Israel’s full repentance? “What, then, can we say as Bible believers in response to the question, “Is it a sin to divide the land?” To review: 1) All parties involved must remember that the land of Israel is God’s land, not their land. 2) Because of this, all nations which mistreat the people of Israel and misuse the land of Israel will be accountable to him. 3) Yet Israel is not entitled to full possession of the land without full repentance and full obedience, which has not happened so far in the nation’s history and is certainly not happening today. 4) Consequently, Israel does not have a “right” to be in the land; rather, Israel has been regathered by the mercy of the Lord. 5) At the same time, it is undeniable that the Lord has regathered and reestablished the nation, which indicates clearly that he is in the act of bringing his eternal purposes to pass. 6) Before Jesus returns, it appears clearly that there will be a sovereign, secure, Jewish state with Jerusalem as its center. The chapter by Erez Soref called “The Messianic Jewish Movement in Modern Israel” is quite moving in that it tells the story of how the Gospel can and does change the hearts of Palestinians. That in turn leads them to love the Jewish people and opens the door for reconciliation. The other chapters are well written and there is plenty to learn from each author. If these topics interest you, I highly recommend this book. Next Article Why Would a Jewish Person Want to Be Identified with the Crucifixion of Jesus in the First Century?